She’s a hard worker, has a voice that sets her apart from today’s singers and was discovered by Grammy Award winning producer Cory Rooney. Her debut single I Will Follow You was released in July and has already made the Brazilian born singer an artist who will definitely make her mark in the music industry. We sit down with Laura to talk about her debut single, what artists have inspired her and influenced her music and how technology and social media is affecting the music industry today. Pop Culture Principle – Did you know you always wanted to be a singer/musician? Laura Pieri – Yes, that’s exactly what it was. My whole life, I’ve really been involved with music and it’s always been around me. You know when you’re five years old, all little girls want to be singers? That’s what it was for me and I just never changed my mind. Pop Culture Principle – Being born and raised Sao Paulo, Brazil, how has that affected and or influenced your music and style? Laura Pieri – Well, growing up in Brazil really influenced how I received music in a way. My grandfather played a lot and I always listened to him playing. I’ve always been really connected to that grounding feeling that has been around music. The mainstream influence of music in Brazil is pop music, so I kind of grew up with that as well. Pop Culture Principle – Corey Rooney, who is a Grammy Award winning producer and writer, discovered you. Can you talk a little bit about how that came about? Laura Pieri – Well, I moved to New York to pursue my studies. Both Corey and I had a friend in common and they introduced us. We talked about going into the studio and once we did go into the studio, it just clicked for us. Pop Culture Principle – When you began working with him, did you feel any pressure knowing he’s created hit music with artists such as Mariah Carey and Jennifer Lopez or did you have the mindset of just going in and doing your own thing? Laura Pieri – Well, I think it was a little bit of both really. The thing about working with Corey is that he really gives the artist the power and wants to know what you want to do. He really just tried to bring out the best that I had to offer. So, while I did feel some pressure given that he is a legend, but at the same time, I felt empowered to do what I felt like I should be doing. Pop Culture Principle – The first single and video that you have dropped in the States is I Will Follow You. Can you talk a little bit about the inspiration for the song and going in the studio to record the track? 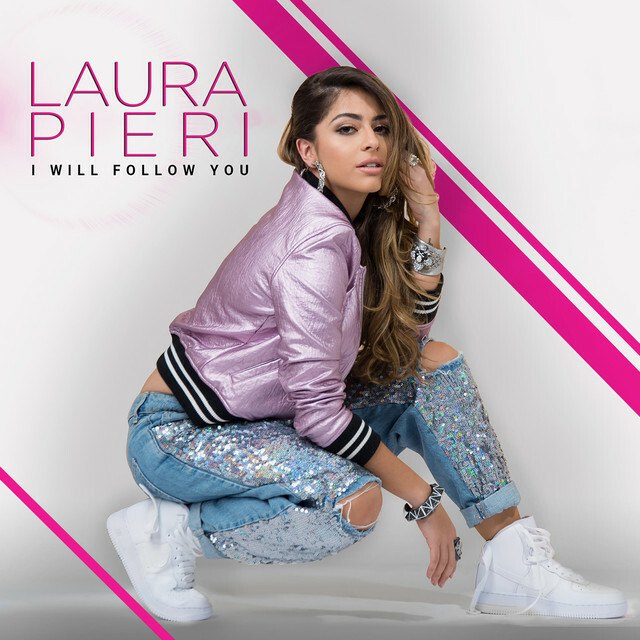 Laura Pieri – Actually, I Will Follow You was one of the last songs that we worked on. We’d been in the studio about two years just trying out a bunch of different things out and a bunch of different styles. We came across I Will Follow You. We had talked about the song before and the feel of it is something that is so relatable. There is always someone that you will do anything for and follow anywhere. From that, just getting into the studio and working on the song and immediately while I was recording the song the idea for the video just made sense and it was really clear in my head. When we had the video concept, we just knew that was the single to go for. Pop Culture Principle – You’ve mentioned in previous interviews that Michael Jackson has been a big influence on your music. Can you talk a little about his influence and any other artists that have influenced you musically? Laura Pieri – There is a specific Michael Jackson song called They Don’t Really Care About Us and that song, given where it was shot, as a Brazilian, seeing someone represent my culture in such a passionate way, it made me feel something for music that I never felt before. It made me feel connected to everybody else that really felt that feeling. Brazil still really isn’t on the map in some ways, so that song really made such a difference in my life personally and then, all his other songs, it just felt like he was there for me through his music and that really got me into believing in music and believing that this is something that I can do. From there, I saw Shakira and J Lo on stage and for the first time, I thought Latinos could do it too and be up there on stage. That really changed the way that I see pop culture itself and I never thought that it was something that was even remotely possible. Also seeing Shakira rock her natural hair inspired me to do the same. So, it was huge for me to see them on stage and not only that, just to see what they have done for the world since then. Pop Culture Principle – Now that your first single is out, are you working on music for your first full-length album and do you have a general idea of when it will be released? Laura Pieri – We are not really sure. We are still in the studio working and making new music. I think it will be just like I Will Follow You. When we feel like we have something, that’s when we will know. Pop Culture Principle – It seems today that the music industry is a singles driven industry. What are your thoughts about that and do you feel it hurts or helps today’s artists? Laura Pieri – I completely agree. I feel like it goes hand in hand with us being in this social media age and how that really influences how people make decisions and how people live their lives. I do think that it is the singles age as well because it’s more accessible, it’s quicker, it’s easier and that’s really what the online community is about, but on the other hand, getting the word out about new music, the boundaries are so much looser these days. Pop Culture Principle – If you could work with anyone in the music industry today. Who would that be and why? Laura Pieri – I go through different phases when it comes to the music I listen to if I’m being honest. Right now, If I could do a collaboration with anyone, it would be Zedd. I really like his new work and what he’s doing for the techno scene and how he’s bringing it to the mainstream, yet maintaining his own style. I really like his work. Pop Culture Principle – We touched on this earlier, but do you feel technology has been a help or a hindrance when it comes to artists and the music industry? Laura Pieri – You know, I think it’s both. The only reason that we are able to put out the single I Will Follow You is because of the internet and because we have the power of YouTube, Spotify and iTunes. At the same time, it also means that music is less meaningful and it’s so easy to get swamped with all this new music coming out. Pop Culture Principle – How important has social media been not only for your music but for reaching out to fans and supporters? Laura Pieri – That’s actually my favorite part of what I’ve been doing lately. If I go on Facebook Live for example, I get a lot of fans reaching out saying that they enjoy my music and are just so supportive. I see messages from the fans and I read all of them. It’s a really cool way for fans to get in touch with you and tell you what they like or even what they don’t like. This morning, I read a message from someone from the Philippines who said they found my video randomly and that was cool for me because I would have never known that. At the same time, I also feel like it’s really hard to portray a realistic life. Sometimes we aren’t always who we are on social media. Sometimes we have bad days and sometimes we have sore throats. I definitely try to see it as more of a blessing than a curse, even though I feel like it’s both. Pop Culture Principle – Although you are early in your career, what advice would you give an artist just starting out? Laura Pieri – I think I would just say stay true to who you are and don’t be afraid to try because the only reason that things work out is because you give them a try. If someone told me two years ago that I would be in LA working on my music professionally, I would have told them they were crazy and yet, that seems to be where I am at right now. Honestly, you need to believe in yourself because if you don’t, then no one else is going to. Pop Culture Principle – Where do you see yourself and your career five years down the road? Laura Pieri – Oh my gosh! I don’t even know where I’m going to be tomorrow! LOL. I just really want to continue making music and inspiring people with my music. We would like to thank the very talented Laura Pieri for taking time out of her busy schedule to talk with us. If you would like to keep up with all her latest news and projects, you can follow all her social media Twiiter, Facebook and Instagram via @thelaurapieri.